What Are the Causes of Pain in Shoulder When Lifting or Stretching Arm Upward? 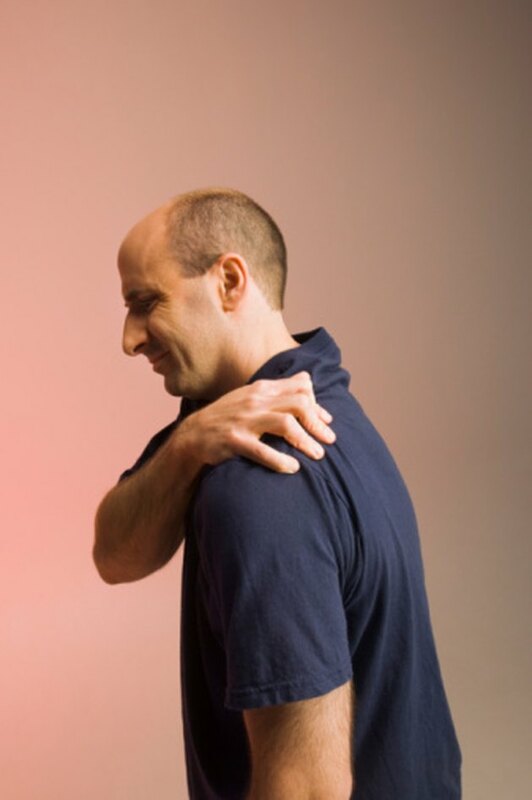 The onset of shoulder pain can be related to an injury or to the overuse that occurs with repetitive activities, such as those you might perform in sports, exercise and manual work or household tasks. Injury or overuse of the shoulder joint can damage the ligaments, tendons and muscles in the shoulder. The possible causes of shoulder pain when using the shoulder joint in a lifting or overhead stretch movement are many. Shoulder pain can begin in the joints or the tendons, ligaments and muscles and usually worsens with movement of the arm or shoulder. The rotator cuff, which is composed of four tendons, allows for a range of motions in the shoulder joint. Injuries or overuse can result in tearing, inflammation, bony changes or swelling around the tendons, which causes pain when you move your arm straight out in front, behind your back or above your head. Chronic shoulder pain results from injuries. Long-term shoulder conditions usually develop over time with recurrent episodes of pain and discomfort. Conditions that might cause shoulder pain when reaching above your head or lifting include arthritis, frozen shoulder syndrome, shoulder bone fractures and dislocated shoulder. Bursitis causes shoulder pain when the subacromial burse, which is the sac of fluid that cushions the tendons, is damaged and becomes inflamed. According to MedlinePlus, the most common cause for this type of pain is rotator cuff tendinitis, which occurs when damaged tendons are inflamed and swollen and become compressed between bones. Rotator cuff tendinitis results from normal wear and tear related to age, injuries and repetitive use of the shoulder joint. Pain from rotator cuff injury usually occurs in the front of the shoulder or outside of the shoulder. The pain worsens when you lift something over your head or when you raise your arm. The pain might prevent you from using the arm and the condition often causes pain during sleep. The symptoms of bursitis include aching, stiffness, pain when you move or press the joint and swelling and redness around the joint. Shoulder pain can be effectively treated with ice, rest and exercises to improve range of motion and strengthen muscles and tendons. MedlinePlus recommends using an icing cycle that includes 15 minutes on and 15 minutes off. Perform the icing three to four times a day for about three days. After a few days of rest for the shoulder, and decreased pain and swelling, you can slowly resume your normal activity. Exercises and stretching can help prevent frozen shoulder syndrome. Your shoulder pain requires medical attention if you have disabling joint pain that lasts longer than two weeks, excessive swelling, red or blue skin color near the injury, rash, fever or very sharp pains. Prevent shoulder pain by stretching and strengthening your tendons and muscles and using proper techniques during sports and exercise participation.